KITC would like to welcome back guest blogger, Stephen Johnson. Stephen Johnson is an Ottawa writer who loves to write about family travel. During the summer, you will most likely find him and his family at a local fair or festival. During the winter, a beach in Mexico is a likely bet. One of my favourite activities as a kid was to go sliding down our local hill. Growing up in Moose Jaw, Saskatchewan, the hill was more like a bump compared to Ottawa standards but I still a great time. When I saw Mount Pakenham had tubing along with downhill skiing, I thought it would be a perfect opportunity to introduce our son, David and my wife, Sandy to the activity. We set out to Pakenham on the Sunday of Family Day weekend. The weather (for once) was perfect for outdoor sports. Arriving at the mountain, the first thing that struck us was the beauty of the place. Set in the Ottawa Valley, Pakenham has a family feel that might be lost at larger, more expensive ski resorts. As previously mentioned, being from Saskatchewan, downhill skiing is not my go-to winter sport so we opted for the tubing and snowshoeing option. We headed over to the tubing hill and picked up our inner tubes. There was not a lift taking us to the top of the hill but it was not an overly long walk and the pathway was well-maintained. Once we reached the top of the hill there were two possible runs open. David enthusiastically hopped in his inner tube and asked the staff attendant to give him the full spin option. We watched David speed down the hill with a smile on his face for the entire ride. Sandy and I romantically rode together holding each other’s inner tubes. We opted for the gentler push which still provided an exciting ride. For the next go-around, David wanted to take a ride with me. On our climb to the top, he proposed doing the maximum spin-o-rama. By the time we reached the top of the hill, I was able to negotiate him down to the mild spin. Whatever way, we had a lot of fun. We took another three or four trips down the hill and had a blast. Once done with tubing, we were able to borrow snowshoes and check out the trails. We took a scenic walk through the forest and were able to take short diversions off-trail because of our snowshoes. After about a half hour exploring, we had worked up an appetite and headed back to the main lodge area. We opted for the cafeteria inside the lodge which offered comfort food like soup and sandwich, poutine and hamburgers. They also had lighter fare including salads. We enjoyed our meal in the convivial company of fellow tubers and skiers. The resort also has a lounge and bar that is open to families before a certain time. There was also an outdoor canteen that offered food as well. We ended our time at the ski resort soaking in the sunshine and admiring the skiers racing down the mountain. If you have time, the village of Pakenham is worth a stop. The Pakenham General Store was originally built in 1840 and has some of the tastiest cinnamon buns I have ever tasted. It is also worth to check out the five span bridge which was originally constructed in 1903 and is built completely out of stone. Special thanks to Mount Pakenham for providing David and his family with tubing and snowshoe passes for the purpose of this article; all views are his own. KITC would like to welcome back, guest blogger, Stephen Johnson. Stephen Johnson is an Ottawa writer who loves to write about family travel. During the summer, you will most likely find him and his family at a local fair or festival. During the winter, a beach in Mexico is a likely bet. Two years ago, I didn’t understand all the buzz about escape rooms. The concept of locking yourself up in a room and having to escape within a certain time seemed crazy to me. My perspective totally changed when we recently tried an escape room in Kingston, Ontario. Our family had a great time searching for clues and working together. It left us wanting to find an escape room closer to home in Ottawa. We checked online and found one close to our house that looked like fun, Room Escape Ottawa. There were five different rooms to choose from with three being listed as youth-friendly. Despite our son, David’s, protests to try the scariest room, we all settled on Boom Room. The description listed the room as being a rigged enemy bunker that was timed to explode with only sixty minutes to escape. Our house has a similar feel in the morning to get everyone up and out the door on time so I thought our chances were good. We arrived at Room Escape on Bank Street and found out it was in the same facility and business as Archery Games Ottawa. I wondered if perhaps we did not finish the room on time, we might have to do archery games without a bow and arrow! We were greeted by our escape room host who went over some of the procedures and gave us the scenario. We entered the room and quickly got to work. The room was dimly lit except for a red emergency light giving the space the feel of a World War II bunker. It was authentically decorated with camouflage and other military paraphernalia. We were also provided with a walkie-talkie where we could request assistance. Clues were provided either via a television or our host would come in to assist. I thought this was a great feature especially for those with younger kids as it could be frustrating to be stuck on one puzzle for too long. I do not want to give away too much of the escape room in case you try it, but let’s just say there were many different elements including cracking codes, interpreting a board game and diffusing bombs. Ultimately, we did not make it all the way out of the room but got very close. This experience is a great way to teach problem-solving skills, working together and generally just having a great time. Room Escape Ottawa has two other rooms which are suggested for the younger set. Stranded explores being stuck on an alien planet while another De-Composed is listed as being Canada’s first multiplayer virtual reality escape room. We will certainly be back to Room Escape Ottawa whether to try out another escape room or archery games. I still don’t think anyone from their staff could escape our house as quickly as we do on a Monday morning! My family ended the summer with a trip to Parc Omega in Montebello, Quebec. My daughter, who is now ten, had never been before, and it had been on our to-do list for way too long! I have only ever heard good things about Parc Omega, so honestly, I don’t know what took us so long to visit! 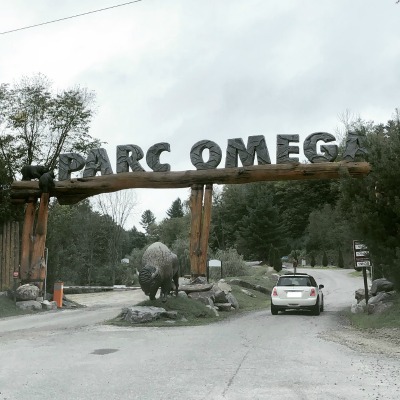 You know you have arrived at Parc Omega because of the impressive arched sign at the entrance. Upon arrival you receive a warm welcome as well as a map explaining where everything in the park is and what you can expect. You can then drive up to the park house for refreshments and a bathroom break or head right onto the Car Trail. We were immediately greeted by elk and red deer. They were standing in the middle of the road just waiting to be handed carrots! It was suggested to us to snap the carrots in half for the larger elk and deer and snap them into quarters for the white-tailed deer and fallow deer, since they have smaller mouths and teeth. This also prolongs your carrot supply. My daughter took it upon herself to adjust the size of the carrot based on the size of the animal in question. Our first stop was the First Nations Trail. All year long, the First Nations trail makes for a great family walk. 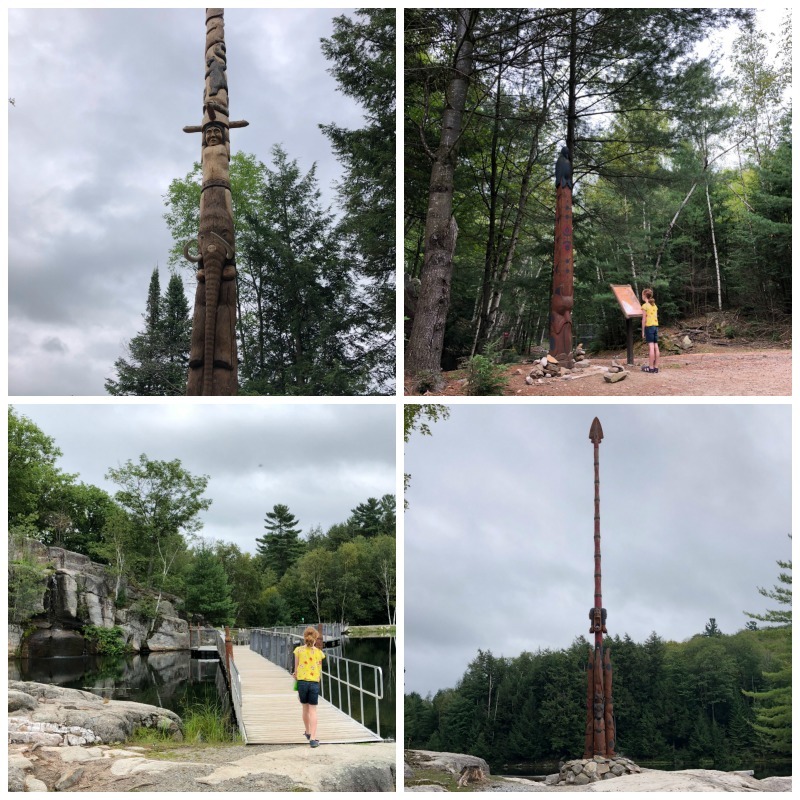 Throughout the walk you can learn the history of 11 of the First Nations of Quebec through beautiful totem poles made by a Native American artist. My daughter loved learning about the creatures on each totem pole and what they stood for. Each totem illustrates the intimate relationship between aboriginal peoples, nature and their culture. The First Nations Trail is about 1km (about a ten-minute family and stroller friendly walk, in the summer) and is surrounded not only by the totem poles representing the 11 First Nations, but also beautiful forest and of course, wild deer anxious to be fed. There are also picnic tables, tipi-shaped shelters (a great picnic spot on a rainy or sunny day!) as well as a picturesque waterfall, which makes for a memorable social media moment! At the end of the trail is the Thunderbird. As noted on the Parc Omega website, the Thunderbird is a symbolic emblem often represented in first nation groups, marks the end of the trail, when passing under his wings you will benefit from its powerful protection. My daughter thought this was pretty cool and made sure all of us did it. After visiting the First Nations Trail we slowly made our way past Beaver Lake and the meadows. We fed many elk, deer, wild boars, as well as admired the buffalo and even a couple of raccoons we saw trying to steal some leftover carrots from deer. My daughter thoroughly enjoyed having animals of all sizes try to stick their heads through our half-opened car windows in an attempt to get as many carrots as possible. She made sure each of them got a piece of carrot and patted the nose of some of them too. There is more than 15 km of car trail covering animals representative of much Canada’s wilderness including meadows, hills, and lakes. The wolves observation area has two levels that allow you to observe the wolves in their natural habitat. Three times a day there is a show in which a guide shares facts about the wolves as well as feeds them. He explains the hierarchy of the pack as well as answers any questions members of the audience may have. We watched the wolves walk around their area for nearly an hour. There were three cubs present and we found it very fascinating to watch them try to exert their strength with the older wolves in the pack. If you have never seen wolves up close and want to learn more about them, Parc Omega is the place to go! During the summer, there are also kids shows taking place at various times. There was a wild birds show as well as a skit that took place while we were there. The little ones found the skit very funny – and the older kids loved the wild birds show. This original and unforgettable wood sculpture is created by artist M. Therrien. It is a must see! 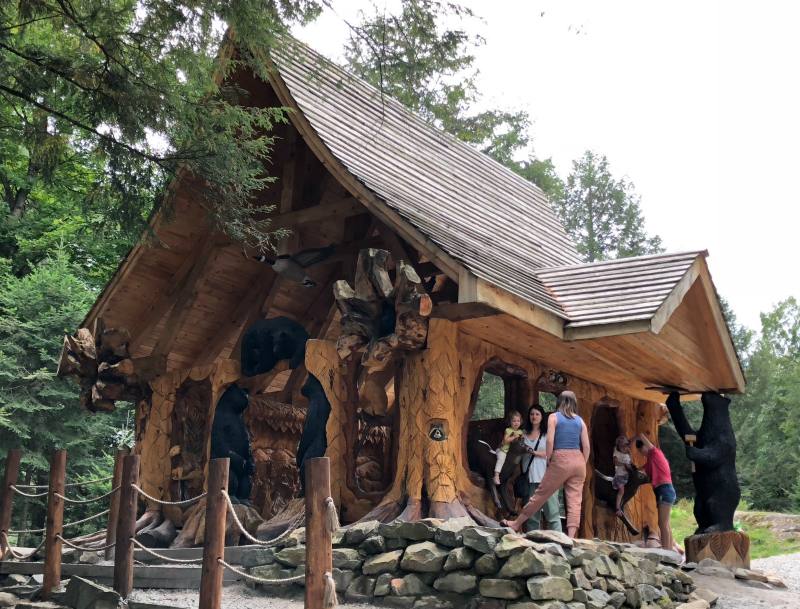 The detail in the house is unbelievable and whether you are 2 or 102 you will appreciate it as well as the many other wood sculptures that are located within the Colonization Area. Take a break and enjoy this unique playground and aerial course for older kids and adults alike! Whether you take the five-minute wagon ride or take the ten-minute walk to the Old Farm, it is a must see. There are sheep, goats, chickens, rabbits, pony rides and more waiting at the farm. There is also a small coffee shop and a playground. When we were there, the farm’s garden was in full bloom and was simply stunning! You can purchase carrots in the park house for $3 a bag. We easily went through four bags in the course of the day, but one bag of carrots per child would do (us adults were having fun too). Don’t forget the wild boars! The wild boars are friendly too and they will take carrots, but we were told by a friend to bring apples, and when we rolled an apple their way – they devoured them. Just be gentle and don’t throw them at them – we gently tossed them near them and they would work their way over. It was very cute watching the younger ones play-eat with the apples. Plan to spend an entire day at Parc Omega. The First Nations trail area took us about an hour to walk, take pictures, read and savour. It is a beautiful and serene area. Take your time driving through the park. Remember, everyone is there to enjoy the animals and the scenery, so be patient with other drivers and feed as many of the hungry wild deer, elk and caribou as you can. The Colonization Area is a popular stop. We spent nearly three hours here! We brought a picnic lunch, which intrigued the deer in this area, but we also splurged on soft serve ice cream and poutine -yum! Arrive early. The Parc is definitely a full day experience, so plan to come when the doors open and spend the day exploring, taking pictures of the many animals including the adorable arctic foxes, cinnamon bears, and arctic wolves. Stay overnight. Parc Omega has cabins and lodging available for an overnight visit – this is something we will be looking at for future visits! Imagine being able to feed deer right outside your door! There is so much to see and do at Parc Omega. It is a fun way to get to know the animals of Canada’s vast and varied landscape, as well as learn more about the First Nations and their culture. The park is clean and the animals look well cared for. I look forward to our next trip to Parc Omega. Have you been to Parc Omega? If so, share your favourite memories and moments with us! Disclaimer: We received free admission to Parc Omega for the purposes of this review, but all thoughts and opinions are my own... and we will be back! This summer my family and I decided to take trips closer to home, so on the August long weekend we took the train to Toronto, Ontario. It was my daughter’s first time on the train and between the comfortable seats and free WiFi, she is already asking when we can take the train again! Although we had driven through Toronto several times, we had never spent quality time there. My daughter had heard about the CN Tower and has asked many times when she could see it. She had also heard a lot about Ripley’s Aquarium of Canada and has wanted to see it for “years!” So, needless to say - she was excited for our trip to Toronto. So, off we went. Our first must-see stop was the CN Tower. We went in the evening, which is a quieter time to go if you are trying to avoid lineups. They are open until 11 pm most nights, so later in the evening is a great time to watch the sun set and to admire the lights over the city of Toronto. The line ups during the day can be extremely long – and the line you see from the front doors is the security line (so have your bags, etc. ready to be checked). Then there is another line once you purchase your Tower Experience tickets. This line can be up to another two hours, but you can purchase Timed General Admission for the Look Out Level, which gives you a specific date and time for an expedited trip up. I highly recommend this purchase – especially if you are travelling with young kids. You can purchase tickets online ahead of time as well, which is a great time saver. We did not visit the SkyPod, but it definitely has the best views of the city as it is the highest observation level; however the floor to ceiling windows on the Look Out Level satisfied our ten year old’s curiosity level. The glass floor on the Look Out level was the biggest highlight for my daughter. She loved walking on it, sitting on it and kneeling on it - trying to make out what she was seeing below. She also thought it was cool to see the sharks that circle the roof of Ripley’s Aquarium of Canada. 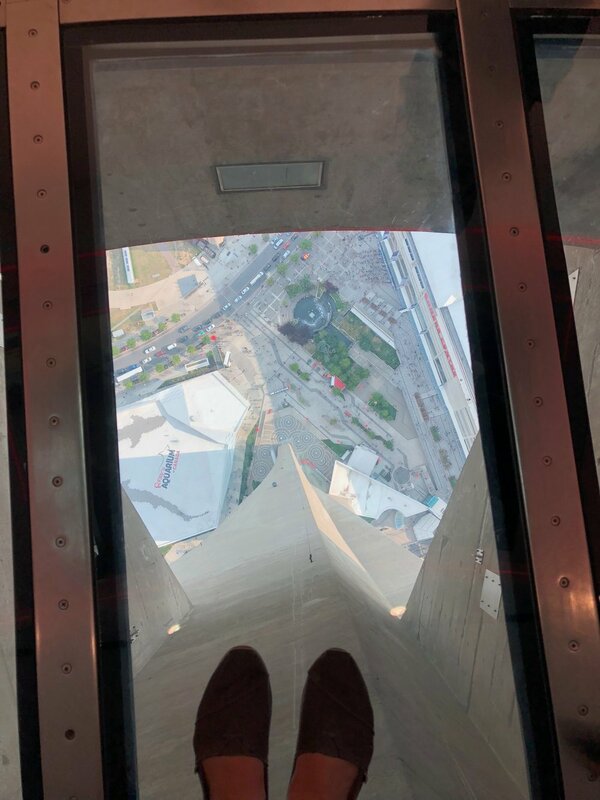 If you plan on visiting both the CN Tower and Ripley’s Aquarium of Canada, take a look at the “Sea to Sky” pass – it covers admission to both attractions at a lower price than paying for them separately. We went to Ripley’s Aquarium of Canada first thing on a Saturday morning. If you go on a weekend or during a peak period, such as summer or March Break, I recommend going when doors open or in the evenings for a less crowded experience. The busiest hours are 11 am to 4 pm during peak dates, but even then, you will be in awe of this aquarium’s galleries and programming. Although it may look small from the outside, this aquarium features sea life from all across the globe including Canadian waters. My daughter, who enjoys fishing, loved seeing a big bass swimming about in the Canadian Waters gallery. Between the Rainbow Reef gallery, which is filled with colourful tropical fish we had previously only seen in Disney movies, and the Dangerous Lagoon filled with a wide array of sharks, turtles and sting rays, this aquarium is a feast for the eyes! The moving floor in the Dangerous Lagoon moves you through a glass tunnel where visitors can watch ocean life in motion. You will feel like you’re truly underwater. We loved it so much we did the Dangerous Lagoon twice! My daughter was curious as to why the sharks in the Dangerous Lagoon didn’t eat the other sea life. We asked a staff member who told us that the sharks are lazy and in the wild don’t eat very often, and because these sharks are in captivity they know they will be fed, so don’t feel a need to exert energy hunting when they know where their meals are coming from. The aquarium experience comes with many educational facts, displays and an interesting “Life Support Systems” gallery that teaches visitors how they keep the tanks clean and the fish and other creatures healthy. Visitors of all ages will love Ripley’s Aquarium of Canada. There is so much to see, do and learn while there. It’s definitely an attraction I can see myself returning to! When was the last time you took a trip up the CN Tower? Have you visited the Ripley’s Aquarium of Canada recently? Share some of your favourite memories from two of Toronto’s biggest tourist attractions with us – we’d love to know! **Special thanks to CN Tower and Ripley's Aquarium for their hospitality and assistance in writing this post. Views are my own. When recess and phys ed are so restricted in public schools these days, how can parents take initiative to get their kids moving? I know for me, it's hard to find the motivation to get the kiddos out after a long day at school, especially when we have to get dinner made and bedtime routine started early (we prioritize an early bedtime in our house!) In the warmer months we always get out for a post-dinner walk or bike ride....but the winter months are HARD!! Just when I was despairing that winter would never end, I got a cool invitation from a new activity in Ottawa called N.U.T.S. The name stands for "Neuron Upgrade and Training Station." 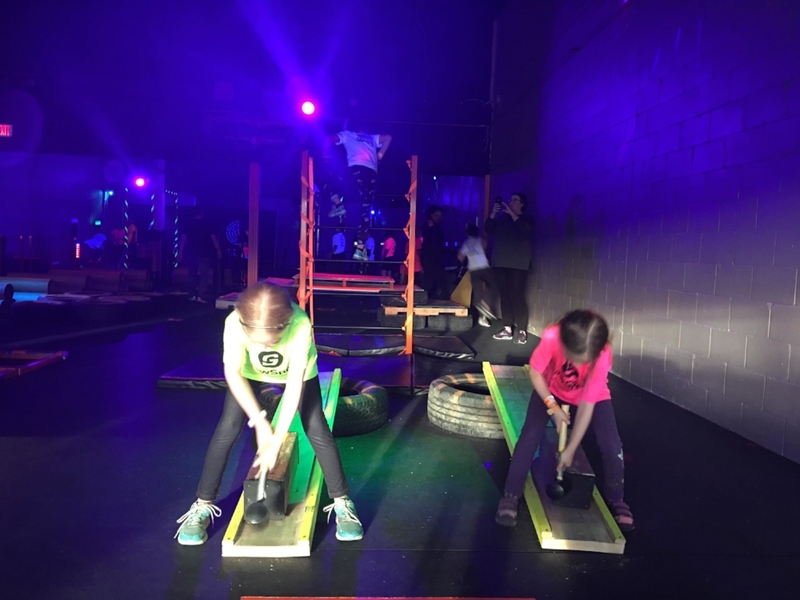 The facility is located near St. Laurent and Industrial Rd, and last week the Kids in the Capital team and friends got to check out this obstacle course where both your mind and body are challenged. When we arrived we walked into a huge dark room with glowing black lights and upbeat music. Friday and Saturday nights at N.U.T.S are glow-in-the-dark, courtesy of Glow Sport. The first order of business is the waiver form. You then get to choose which type of trivia you would like, and I mistakenly chose Rock 'n Roll (mental note: I do not know ANYTHING about rock 'n roll.) When you give the staff your email address, all of your scores on the trivia portion of the obstacle are averaged out and you're emailed a score - so you can go back and try to beat your last score! The obstacle course is not a race, but of course, some kids loved to see how fast they could do it! There is a lot of jumping, crawling and climbing. 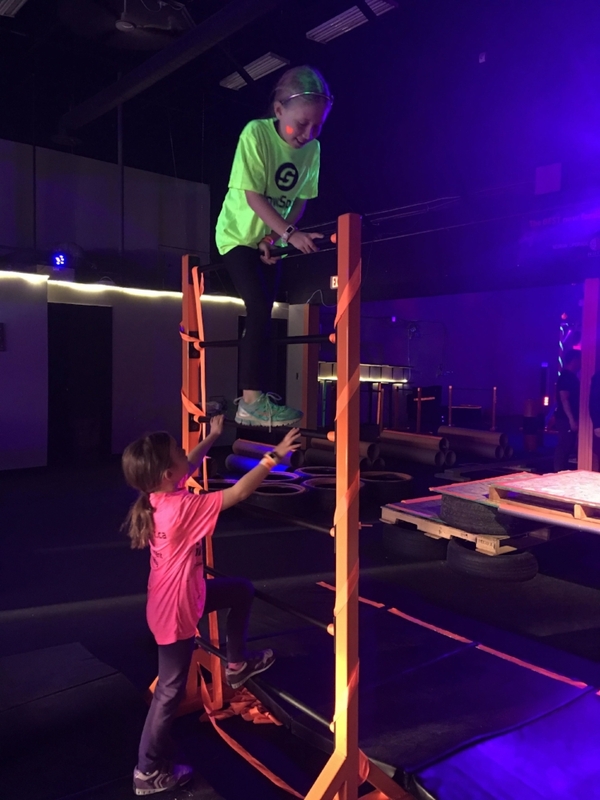 Most of the challenges along the way can be modified, so that older/stronger kids can choose the harder options on the obstacle, while younger kids can do something a bit easier. Anytime an obstacle is too much, we were instructed to do 10 jumping jacks instead! Have you ever gone for a walk and then had some brilliant breakthrough in your work or at school? Well, that's because physical activity is good for our brains! It gets all those fancy synapses firing in there, and answering the trivia questions was super fun. N.U.T.S is available for specific drop-in times, and they also tour all around the city visiting schools and having children take part in the obstacle course. They regularly host groups in their space, ranging from school-aged kids to workplace team building activities with adults. This place is on our "must-return" list, and I can't wait to challenge myself again.